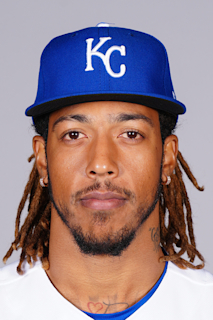 Relationship(s): son of Raul Mondesi brother of Raul Mondesi Jr.
Full name is Raúl Adalberto Mondesi...resides in San Cristobal, Dominican Republic...Son of 1994 National League Rookie of the Year, Raul Mondesi, who played in 13 Major League seasons with the Dodgers (1993-99), Toronto (2000-02), the Yankees (2002-03), Arizona (2003), Pittsburgh (2004), the Angels (2004) and Atlanta (2005)...Older brother, Raul Jr., played in the Milwaukee Brewers' and Tampa Bay Rays' organizations. Became the first player in Major League history to record at least 14 HR and 32 SB in 75 games or fewer...In the last 45 years (since 1974), his combination of HR (14) and SB (32) is matched by only six others in their age-22 season or younger, including: Mike Trout (2012-13), Hanley Ramírez (2006), Jimmy Rollins (2001), Alex Rodriguez (1998), Sammy Sosa (1990) & Barry Bonds (1986-87)...Started the season on the DL due to right shoulder impingement syndrome…made his season debut on April 30 with Omaha (AAA), where he hit .250/.295/.492 (30-for-120) with 16 extra-base hits, 21 RBI and 10 stolen bases in 29 games...Recalled on June 17 and spent the rest of the season with Kansas City...Named Joe Burke Special Achievement Award winner by the Kansas City chapter of the BBWAA...Hit just .143 (3-for-21) in his first seven games, but hit .287/.316/.524 (73-for-254) in 68 games after that...His 14 HR were third most on the team-despite not making his debut until June 17-trailing only Salvador Perez (27) and Mike Moustakas (20)...Started at shortstop on June 22 at Houston, becoming the first Royal other than Alcides Escobar to start at the position since Sept. 25, 2015 (Christian Colón), snapping Escobar's streak of 407 consecutive starts at shortstop...Had a career high four RBI on July 10 at Minnesota, including a three-run HR, becoming the first Royals shortstop other than Alcides Escobar to HR since Yuniesky Betancourt on June 6, 2012...Of his 14 HR, 13 came as a shortstop, fourth most in club history behind: Jay Bell (21 in 1997), Angel Berroa (17 in 2003) and Yuniesky Betancourt (16 in 2010)... The Royals went 29-29 (.500) in his 58 starts at shortstop, and 29-75 (.279) in all other games...Ranked fourth in the American League with 32 stolen bases, despite not making his season debut until June 17 (75 games)…he's one of three AL players since 1900 to record at least 32 SB in 75 games or fewer, joining: Alex Cole (40 in 1990) and Coco Crisp (32 in 2010)...Was successful on 32 of his 39 stolen bases attempts (82.1%)…only three players had a better rate and more attempts: Jonathan Villar (35-for-40, 87.5%), José Ramírez (34-for-40, 85.0%) and Trea Turner (43-for52, 82.7%)...Had 27 steals after the All-Star break, one behind teammate Whit Merrifield for the Majors lead ...On Aug. 14 vs. Toronto, he had a career-high four hits and a career-high three steals, becoming the fifth Royal (6th time) with a four-hit, three steal game, joining: Jose Offerman (Sept. 17, 1998), Amos Otis (Sept. 8, 1978 and Sept. 7, 1971), Freddie Patek (June 9, 1971) and Pat Kelly (May 30, 1969, Game 2)...At 23 years, 18 days old, he was the sixth-youngest player since at least 1908 with a four-hit, three-steal game, trailing: Jose Reyes (22.069 on Aug. 19, 2005), Gerald Young (22.327 on Sept. 14, 1987), Tim Raines (21.217 on April 21, 1981), Luis Aparicio (22.146 on Sept. 22, 1956) and Howard Freigau (21.308 on June 4, 1924)…Raines was the only other to do it with two extra-base hits...Over his last 30 games (since Aug. 25), he hit .312/.351/.624 (39-for-125) with 25 runs, 17 extra-base hits (10 HR), 22 RBI and 16 SB…during that time, he ranked among the American League leaders in: HR (tied for 2nd), stolen bases (tied for 2nd), runs (tied for 4th), hits (tied for 4th) and extra-base hits (tied for 6th)...Named Royals Player of the Month for September, batting .282/.322/.564 (31-for-110) with 20 runs, eight HR, 17 RBI and 14 stolen bases in 26 games…his combination of eight HR and 14 SB have been matched in a calendar month by only two others since 1913: Carlos Beltrán (10 HR, 16 SB) in August 2004 and Joe Morgan (8 HR, 15 SB) in August 1976...His eight HR in September were most by a Royals shortstop in any calendar month... Recorded a HR and SB in the same game six times, five of which came in September…the Major League leader for the entire season was Mike Trout, who had seven such games…six such games is third most in Royals history, trailing Carlos Beltrán (9 in 2003, 7 in 2001)...Hit .270/.303/.486 (50-for-185) as a left-handed batter and .289/.312/.522 (26-for-90) as a right-handed batter...In 39 games vs. American League Central teams, he hit .309/.350/.577 (46-for-149), including 11 of his 14 HR. Made his first Opening Day roster, but spent a majority of the season with Omaha (AAA) after being optioned on April 21…over three stints with the Royals, batted .170 (9-for-53) with a double, a homer, three RBI and five steals ... Opened the year as the starting second baseman, but hit .109 (4-for-39) over his first 14 games…returned to the big leagues on Sept. 1 and went 5-for-11 (.455) ... Hit his lone home run on April 12, a solo shot off Oakland's Frankie Montas in the ninth inning…all three of his career roundtrippers are solo shots ... Matched a career high with two steals on April 7 at Houston… collected all five of his thefts during his first 12 games of the season ... Fanned 22 times in just 53 at-bats (41.5 percent) at the Major League level ... In 85 games with the Storm Chasers, batted .305 (98-for-321) with 20 doubles, eight triples, 13 homers, 52 RBI and 52 runs scored…tied for 10th in the Pacific Coast League in triples and ranked eighth in steals (21) ... Selected to the PCL All-Star team, batting .316/.346/.544 (75-for-237) before the break…also hit .350 (48-for-137) with a .642 slugging percentage (12 doubles, five triples, six homers) at Omaha's Werner Park ... Had an 18-game hitting streak at Omaha (May 7-June 1), batting .397 (29-for-73) with 13 extra-base hits and 15 RBI. Spent the entire regular season at Northwest Arkansas (AA)...tied for ninth in the Texas League with 19 stolen bases in 25 attempts...also tied for fifth in the league with five triples…Participated in the MLB All-Star Futures Game in Cincinnati, going 1-for-2 for the World Team…Placed on the seven-day disabled list on April 12 with a lower back strain...reinstated on May 15…Batted .309 (29-for-94) with five doubles, three triples and a homer during the month of August...also tallied 10 steals in the final full month of the regular season. In 2014, led the Carolina League (A) in triples (12), which also tied for seventh among all minor league players ... Named a 'Rising Star' in the Arizona Fall League following the 2014 season…hit .233 with six doubles and five steals for the Peoria Javelinas. Selected as Lexington (A) Player of the Year in 2013 as well as a South Atlantic League All-Star…tied for eighth in the league in triples (7) and tied for 15th in steals (24)…also ranked fifth in at-bats (482), while appearing in a career-high 125 games. KC@TB: Mondesi sprints home at a speedy 30.1 ft./sec. July 24, 2018 Kansas City Royals activated SS Adalberto Mondesi. July 20, 2018 SS Adalberto Mondesi roster status changed by Kansas City Royals. June 17, 2018 Kansas City Royals recalled SS Adalberto Mondesi from Omaha Storm Chasers. April 30, 2018 Kansas City Royals optioned SS Adalberto Mondesi to Omaha Storm Chasers. March 29, 2018 Kansas City Royals placed SS Adalberto Mondesi on the 10-day disabled list retroactive to March 26, 2018. Right shoulder impingement syndrome. October 28, 2017 SS Raul Mondesi assigned to Tigres del Licey. September 1, 2017 Kansas City Royals recalled SS Adalberto Mondesi from Omaha Storm Chasers. May 22, 2017 Kansas City Royals optioned SS Raul Mondesi to Omaha Storm Chasers. May 21, 2017 Kansas City Royals recalled Raul Mondesi from Omaha Storm Chasers. April 24, 2017 Omaha Storm Chasers activated 2B Raul Mondesi. April 22, 2017 Omaha Storm Chasers placed 2B Raul Mondesi on the reserve list. April 21, 2017 Kansas City Royals optioned 2B Raul Mondesi to Omaha Storm Chasers. July 26, 2016 Kansas City Royals recalled Raul Mondesi from Omaha Storm Chasers. July 8, 2016 SS Raul Mondesi assigned to Omaha Storm Chasers from Northwest Arkansas Naturals. July 4, 2016 SS Raul Mondesi assigned to Northwest Arkansas Naturals. July 4, 2016 Kansas City Royals reassigned SS Raul Mondesi to the minor leagues. June 25, 2016 sent SS Raul Mondesi on a rehab assignment to Wilmington Blue Rocks. May 10, 2016 Kansas City Royals placed SS Raul Mondesi on the restricted list. April 1, 2016 Kansas City Royals optioned SS Raul Mondesi to Northwest Arkansas Naturals. November 21, 2015 SS Raul Mondesi assigned to Tigres del Licey. November 21, 2015 Tigres del Licey activated SS Raul Mondesi. October 27, 2015 Kansas City Royals selected the contract of Raul Mondesi from Northwest Arkansas Naturals. August 28, 2015 Northwest Arkansas Naturals activated SS Raul Mondesi from the temporarily inactive list. August 25, 2015 Northwest Arkansas Naturals placed SS Raul Mondesi on the temporarily inactive list. July 15, 2015 Northwest Arkansas Naturals activated SS Raul Mondesi from the temporarily inactive list. July 11, 2015 Northwest Arkansas Naturals placed SS Raul Mondesi on the temporarily inactive list. May 15, 2015 Northwest Arkansas Naturals activated SS Raul Mondesi from the 7-day disabled list. April 12, 2015 Northwest Arkansas Naturals placed SS Raul Mondesi on the 7-day disabled list. Lower back strain. April 8, 2015 SS Raul Mondesi assigned to Northwest Arkansas Naturals from Wilmington Blue Rocks. January 26, 2015 Kansas City Royals invited non-roster SS Raul Mondesi to spring training. June 19, 2014 Wilmington Blue Rocks activated SS Raul Mondesi from the temporarily inactive list. June 12, 2014 Wilmington Blue Rocks placed SS Raul Mondesi on the temporarily inactive list. April 2, 2014 SS Raul Mondesi assigned to Wilmington Blue Rocks from Lexington Legends. March 21, 2014 SS Raul Adalberto Mondesi assigned to Kansas City Royals. March 29, 2013 SS Raul Mondesi assigned to Lexington Legends from Idaho Falls Chukars. June 13, 2012 Raul Adalberto Mondesi assigned to Idaho Falls Chukars. August 10, 2011 Kansas City Royals signed free agent SS Raul Adalberto Mondesi to a minor league contract.